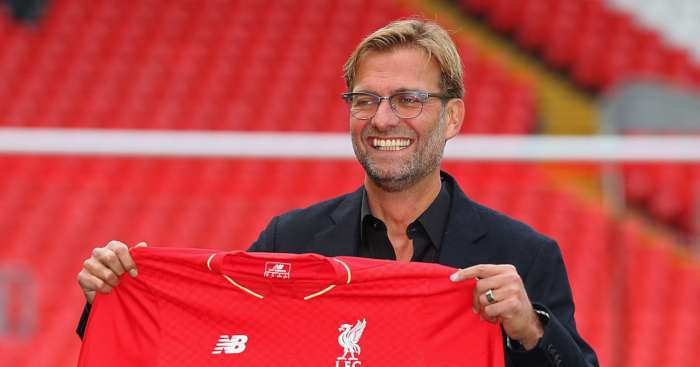 Can Jurgen Klopp deliver on his first promise? 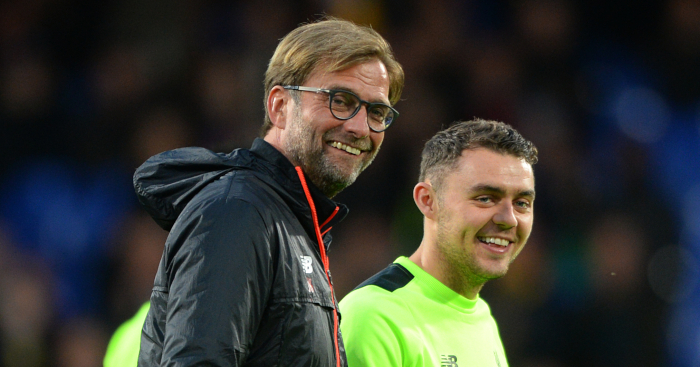 “If we sit here in four years I think we’ll have won one title – I’m pretty sure,” Jurgen Klopp said at his October 2015 unveiling, pledging to move to Switzerland if he broke his first Liverpool oath. He has two last opportunities to come good on his word. The Reds are two points clear at the top of the Premier League table heading into April, with a Champions League quarter-final against the weakest side left in the competition still to come. Klopp ensured they had no excuses not to truly challenge for trophies after an uncharacteristically ruthless 2018. 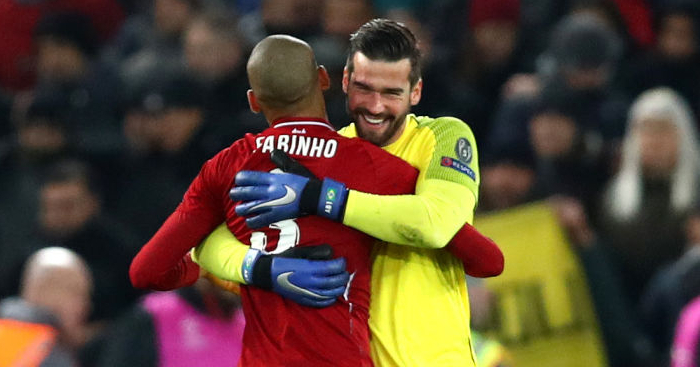 Liverpool broke the world transfer record for both a goalkeeper and a defender last year, signing almost £100m worth of midfielders to complement one of the best attacks in Europe. They could no longer claim Champions League qualification alone as a success, nor sell reaching the final as a welcome and unexpected surprise. The manager insisted on Saturday that this Liverpool side “are at the start of a development, not the end”. That might well be the case, but they may not have a better chance to compete on two fronts at this late stage. Will their walking wounded return in time? Joe Gomez has been sidelined since December; Alex Oxlade-Chamberlain has been sorely missed for almost 12 months. Both would vastly improve a Liverpool squad that has coped admirably in their respective absences, and both are in line to return at some point after the international break. The question is whether they can hit the ground running for a side already sprinting towards the finish line. With Gomez having suffered complications from a broken ankle and Oxlade-Chamberlain already showing signs of inevitable rust after a serious knee injury, the pair will likely need time that Liverpool perhaps cannot afford. Gomez’s return is slightly less pressing with the fine form of Joel Matip, but Klopp really could do with the midfield impetus and drive of Oxlade-Chamberlain. Sod’s law dictates that the former will be back long before the latter, who surely will not be at his best until next season. Naby Keita and Jordan Henderson must also recover from recent fitness setbacks if Liverpool are to have any hope of winning a first trophy since 2012. Is their defence up to the task? It seems a disingenuous thing to ask of a side that has conceded just 18 goals in 31 Premier League games, but the slightest of cracks are starting to form in a previously impervious rearguard. That Alisson and Virgil van Dijk’s mix-up at Fulham did not prove costly will be of scant consolation to Klopp, who knows Sadio Mane cannot be expected to rescue them from every hole they dig for themselves. Liverpool have let in goals in each of their last three games. They face Tottenham at home next, having not conceded in four consecutive matches since January 2018. Manchester City have kept twice the number of clean sheets of their title rivals (12 to 6) since the start of this January, and Van Dijk and Matip might not be able to put out every fire that threatens to break out across the pitch. Trent Alexander-Arnold is also being pushed to his physical limits with little to no sign of a rest at right-back, while Andy Robertson will be suspended for the first leg of the Champions League quarter-final at home to Porto. The stage is yours, Alberto Moreno. Will they make history again? It was difficult to envisage Manchester City improving upon near-perfection last season, yet Pep Guardiola’s side continue to push the boundaries. With a League Cup secured, the champions have the Premier League, the Champions League and the FA Cup within their grasp. It will take a gargantuan physical and mental effort to maintain their grip on all three without letting any one of them slip through their fingers. City have between 11 and 15 games left to decide whether a good season becomes great, brilliant or unprecedented. And the remarkable thing is that it would arguably be more surprising if they let the Crud-ruple pass them by: they are favourites for all three competitions, have won 19 of their last 20 games, and have an incredibly strong squad with momentum behind them. Doubt them at your peril. Could their defensive injuries haunt them? Aymeric Laporte returned from injury mercifully quickly, but there remains considerable doubt over his most suitable partner. He has started 29 Premier League and Champions League games at centre-half this season, followed by John Stones (19), Nicolas Otamendi (17), Vincent Kompany (8), Fernandinho (2) and even Danilo (1). City have used different central defensive combinations in each of their last four games, and while Bournemouth and Schalke were so overwhelmed in defence they forgot to attack, Watford and especially Swansea posed plenty of problems for a side lacking familiarity at the back. The absence of Fernandinho, sidelined for their last five games, has hardly helped either. Will domestic familiarity breed European contempt again? City director of football Txiki Begiristain was speaking after last season’s Champions League quarter-final draw pitted them against Liverpool, but it is a similar story 12 months later. Even though Guardiola has beaten Mauricio Pochettino in their last three meetings, Tottenham should not be underestimated. City’s season could be defined by how they approach the three meetings they have with the north London club in the space of 11 days. Can they avoid finishing fifth or sixth in a three-horse race? As the greatest Premier League manager to win f*** all, finishing the season empty-handed need not necessarily be anything close to a disaster for Pochettino. A Champions League quarter-final berth is undoubted progress in a season of immense uncertainty and difficulty. But if Tottenham advance no further in Europe and continue their recent slide in the Premier League, this season could only be considered a belated failure. A side that has been in the top three since December 5, briefly flirting with a title challenge, simply cannot afford to finish fifth or sixth come May. After qualifying for the Champions League in three successive seasons, failing to make this a fourth will impact heavily on an already huge summer transfer window, and make their first full season in a new stadium a much emptier experience. Can they rise to the occasion? With visits to Anfield and two to the Etihad still to come, Tottenham cannot claim to have it easy. 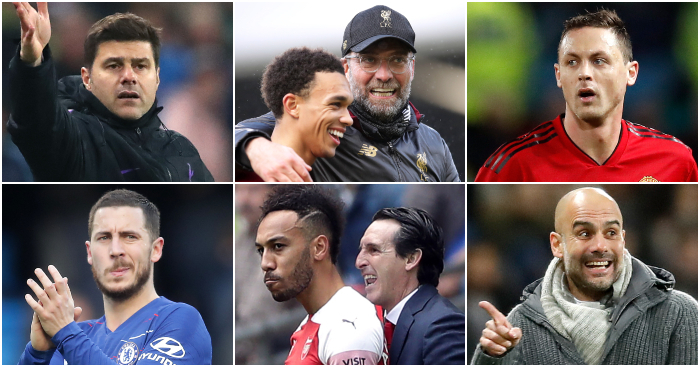 They will hope that they can pull off something miraculous away at Liverpool and Manchester City, with six Premier League points and one leg of a Champions League quarter-final at stake. Theirs is the toughest run-in of any of the top six, and they could find their European dream dashed and one-point cushion to fourth, three-point gap to fifth and four-point lead over sixth overturned rather quickly. Their form in such games – both recently and over the course of a few years – absolutely has to improve for this season to live long in the memory. Might the new stadium be a distraction? After advertising it as ‘the only place to watch UEFA Champions League in London’, Tottenham will finally deliver on a promise they made all the way back in May when they host City in April. With that and the grand opening against Crystal Palace six days prior, Tottenham have at least six games yet to play in their new stadium before the end of the season. As one of only two sides to earn more of their Premier League points away than at home this campaign, Tottenham might consider escaping their Wembley confines as a positive. But they have experienced the difficulties a move poses before, and that will only be heightened in the middle of a season when games are more important than ever. How they acclimatise will dictate where they finish in both of their remaining competitions. Can they improve their away form? Unai Emery (he’s good, you know) has not quite cured Arsenal of their travel sickness, but he has certainly helped. The Gunners have earned more Premier League away points (19) than they managed in the entirety of last season (16), already winning more matches and losing more than half as many. Arsenal are 10th in a Premier League away table, and five of their last eight league fixtures include visits to teams 9th, 10th, 11th, 14th and 17th in a home table. Trips to Everton, Watford, Wolves, Leicester and Burnley are practically mid-table meetings for a side that must continue to prove its mettle away from the Emirates Stadium. Does Emery need to continue his recent experiment? After resisting the temptation to start Aaron Ramsey, Mesut Ozil, Alexandre Lacazette and Pierre-Emerick Aubameyang in the same Arsenal team since September 29, Unai Emery has chosen the quartet in both of the Gunners’ last two games and won by an aggregate score of 5-0. 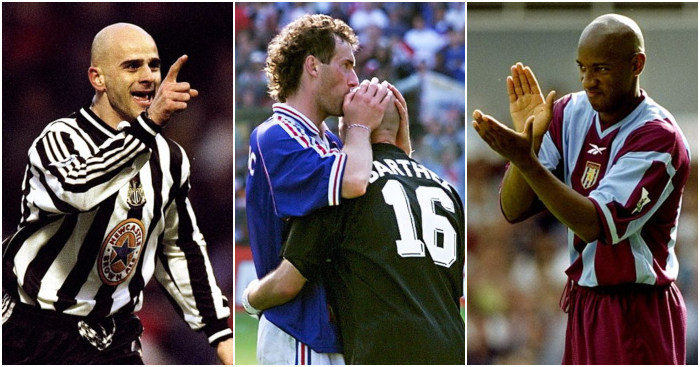 It turns out that playing your best players is quite the revolutionary tactic. Arsenal have won all six of the games in which those four have started, and have scored 14 goals and conceded three in the 487 minutes they have ever been on the pitch together. If your team is scoring at an average rate of once every 34.7 minutes, the necessary defensive sacrifice is clearly worth it. But the matches against Manchester United and Rennes were must-win; might Emery revert to type for games of lesser importance? Emery described the Premier League as “very important” and “the first competition of importance for us” in September, but added that if he had to make “one choice”, his eggs would be placed carefully into the basket marked ‘Europa League’. It was hardly surprising, given his pedigree in the competition, yet that is an easier question to answer at the start of the season than towards the end. Arsenal are fourth in the Premier League with a relatively forgiving final few opponents, while Napoli was perhaps the most difficult assignment possible in the Europa League quarter-finals. Is this a squad that can cope with both challenges? And if not, has a change in circumstances altered his preferred route into the Champions League? Is Ole Gunnar Solskjaer bold enough to drop Nemanja Matic? It has been described as an injury ‘blow’, but Ole Gunnar Solskjaer might view the absence of Nemanja Matic as more of a blessing. The midfielder has been ineffective and peripheral recently, and his shortcomings have been quite ruthlessly exposed. United have lost three of the last four games he has started (PSG, Arsenal and Wolves), winning three (PSG, Crystal Palace and Southampton) and drawing one (Liverpool) of the last four he has missed. Scott McTominay’s best is nowhere near the level of Matic’s, but he is not quite as damaging at his worst either. The former’s dependability is a better option than the latter’s unpredictability. Which players can salvage their spells? It will be the biggest summer of upheaval United have ever experienced. A new manager will surely be supplemented with the appointment of their first ever director of football, while players will come and go. While the central defence will be eager to prove no signings are necessary, a string of other players might have to prove their worth to the cause all over again. Juan Mata and Ander Herrera are on the brink of becoming eminently valuable free agents, Andreas Pereira is in a perennial battle to win an Old Trafford war, Fred has two months to show that fresh midfield competition won’t be necessary, and time is running out for Alexis Sanchez to salvage anything meaningful from what has been a disastrous spell thus far. Futures are on the line from now until May. When does the audition end? United might already have made their collective minds up, but until Solskjaer is confirmed as the permanent successor to Jose Mourinho, that cloud of uncertainty will hang over Old Trafford. The Norwegian could not have done much more as interim manager, opening up two potential routes to Champions League qualification when previously there were none, yet he remains a short-term solution for now. And after two successive defeats, the question has to be asked: might he become a victim of his own success? As Steven Chicken wrote earlier this month, ‘a halting but gradual ascent is oddly often better for a new manager’s reputation than a meteoric rise followed by a harsh comedown. For the rest of the season, he and United will likely be judged against the standards they set for themselves in from late December to February, rather than the much lowlier level they were at under Jose Mourinho.’ By instantly closing that gap instead of steadily doing so, United had possibly done the hard part too soon and too easily. They have already been back in the top four under Solskjaer, so failing to finish there really would represent something of a setback. 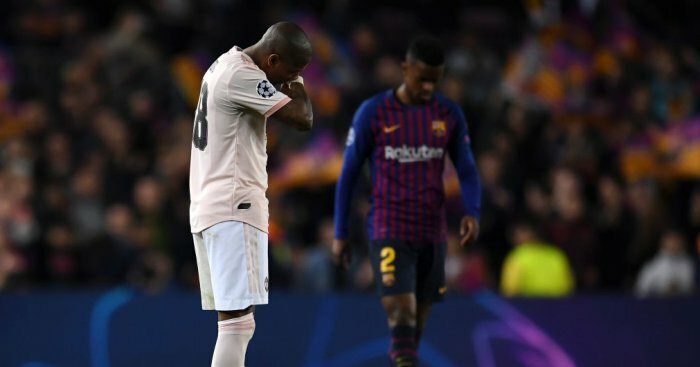 If United finish fifth or sixth and are beaten comfortably by Barcelona in the Champions League quarter-finals – two perfectly reasonable outcomes – is Solskjaer still the automatic choice? The fickle nature of football means that his audition is somehow still ongoing, with no guarantee of a permanent offer at the end. Has the tide turned too far against Sarri? It felt as though a new bridge was under construction after supporters had burned the last one in protest. Chelsea had won five of their subsequent seven games after fans expressed their wish for Sarri-ball to get “f***ed” during the FA Cup defeat to United, losing one on penalties in the League Cup final and drawing the other against a Wolves side known to punch above their weight. But the 2-0 defeat to Everton in that eighth game was one giant stride back after a few smaller steps forward. With that said, the gap to fourth place is still just three points, and Slavia Prague was the least challenging Europa League draw they could have faced. But if both routes to the Champions League are blocked off, it just depends whether Chelsea are in any mood to let a manager fail, particularly if many of the fans are not. Can key players be persuaded to stay? Chelsea are still trying to fight the looming threat of a FIFA transfer ban that could force them to actually use their young players and talk to the thousands they have sent out on loan. There is an argument that being restricted from making new signings could actually galvanise and refocus a club that has become almost obsessed with sell-on value and farming talent, and they certainly have the squad to cope with any possible sanctions. But Chelsea have to show Callum Hudson-Odoi, Ruben Loftus-Cheek, Andreas Christensen and Rob Green that they believe in them, and must prove to Eden Hazard that he can believe in the club too. To simply trust the former group more might be enough to keep them for now, but guaranteeing Champions League football one way or another seems like the only way of persuading Hazard to stay. Will they focus on the Europa League? With visits to Anfield and Old Trafford still to come, Chelsea ostensibly have their domestic fate in their own hands despite sitting sixth. But they have not won away at a fellow Big Six side since the second game of last season, losing five and drawing two of the subsequent seven matches at an aggregate score of 17-5. So they would be forgiven for letting the prospect of a second Europa League trophy distract them. Chelsea were handed the best draw possible, avoiding Arsenal, Napoli, Valencia and Villarreal in both the quarter-finals and prospective semi-finals en route to Baku. Of the six English teams left in European competition, the only other favourites in their respective ties are leaders Liverpool and second-placed Manchester City, neither of whom will be caught by the chasing pack. Chelsea could take advantage and concentrate on sneaking through the Champions League’s back door instead of strolling through the front.